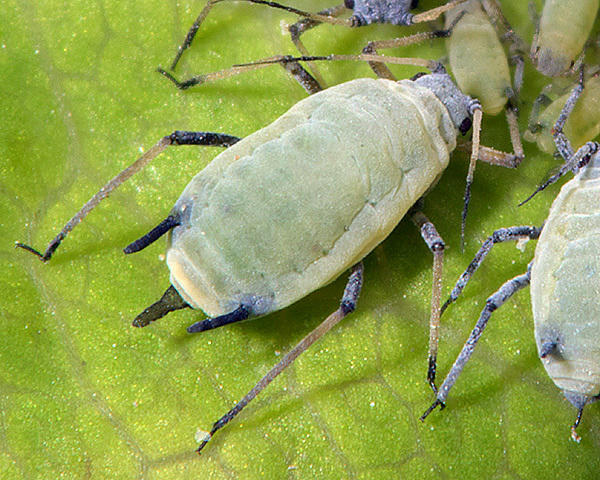 Hyadaphis are medium sized elongate-oval aphids. The antennae are shorter than the body. Their siphunculi are 0.6 - 1.4 × length of cauda and usually slightly swollen in middle or distal part, with an apical flange. The cauda is dark or pale and is tongue- or finger-shaped, at least 1.4 × its basal width in dorsal view. There are about thirteen described species in the Hyadaphis genus. 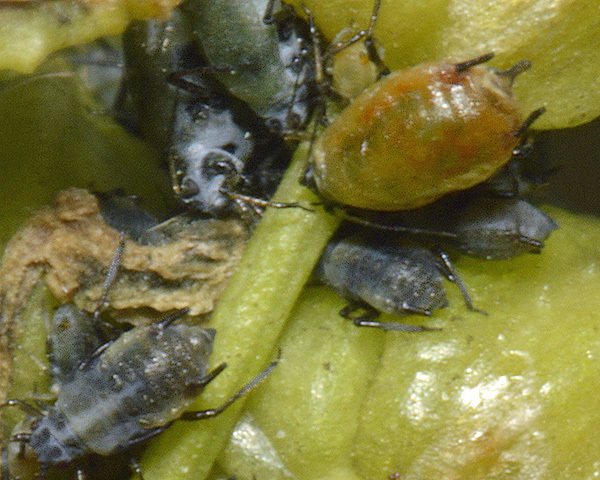 Several species are known to be pests, including Hyadaphis foeniculi (coriander aphid) and Hyadaphis passerinii (honeysuckle aphid). They host alternate from honeysuckle (Caprifoliaceae) species as the primary host to various umbellifers (Apiaceae) as the secondary host. Others complete their entire life cycle on honeysuckle. N.B. The different colours of the apterae of the two species below is not a good indication of the species differences. Both species are variable and the difference in appearance may be more because pictures of Hyadaphis foeniculi are on their secondary host, whereas those of Hyadaphis passerinii are on their primary host. For species separation use the dimensions of the prosternal sclerite and the siphunculi to cauda ratio. Hyadaphis foeniculi apterae on the primary host are greyish-green or light green with the middle part of the dorsum darker green (see first picture below). Their colour is rather more variable on the secondary host and reddish brown patches are often present at the siphuncular bases (see second picture below). The legs and antennae of Hyadaphis foeniculi are dark. The prosternal sclerite is 1.4 to 2.6 times wider than long. The siphunculi are black and slightly swollen and are 1.05-1.4 times the length of the cauda. The body length is 1.3 to 2.6 mm on the primary hosts, 1.4-2.0 mm on the secondary hosts. N.B. The characteristics of some Hyadaphis foeniculi populations that we have found appear to be intermediate between Hyadaphis passerinii and Hyadaphis foeniculi. 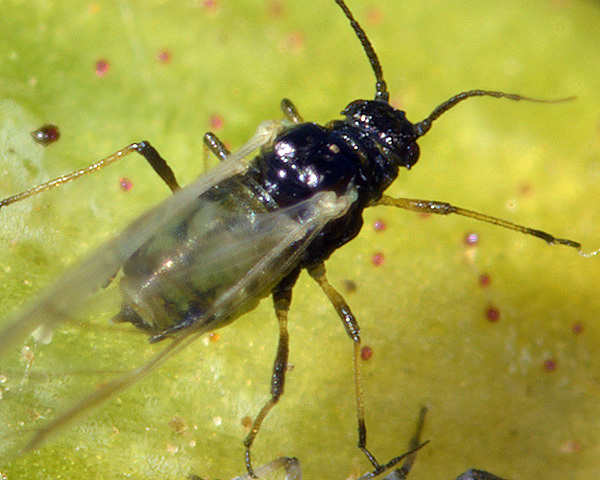 Hence we cannot be certain about their identification of the aphids pictured. Some authorities only give Hyadaphis passerinii and Hyadaphis foeniculi subspecific status. The alate often has 1-4 secondary rhinaria on the fifth antennal segment. Hyadaphis foeniculi host alternates. It mainly uses fly-honeysuckle (Lonicera xylosteum) as its primary host. Infested leaves are curled upwards in spring. Hyadaphis foeniculi migrates to various Apiaceae where it feeds on stems, leaves and flowers. Secondary hosts include hemlock (Conium), fennel (Foeniculum) and Pastinaca. It is widespread in Europe, especially in the north. Hyadaphis foeniculi extends eastwards to Turkey and Iraq and is also found in North America and Brazil. Hyadaphis passerinii apterae (see first picture below) are elongate and grayish green with a waxy bloom. The antennae and legs are black. The prosternum has a dark trapezoid sclerite, visible in clarified mounts, which is 2.7-3.6 times wider than long (cf. Hyadaphis foeniculi where the prosternal sclerite is 1.36-2.6 times wider than long). The siphunculi are black and slightly swollen, 0.85-1.15× the length of the black, elongate cauda (cf. Hyadaphis foeniculi whose siphunculi are 1.05-1.45 times the cauda length). The body length of Hyadaphis passerinii apterae is 1.3-2.3 mm. Hyadaphis passerinii alates (see second picture above) have the abdomen green, mottled with a darker green, and rarely have secondary rhinaria on antennal segment 5. In spring Hyadaphis passerinii colonies curl the leaves of honeysuckles upwards, especially common honeysuckle (Lonicera periclymenum) and perfoliate honeysuckle (Lonicera caprifolium). 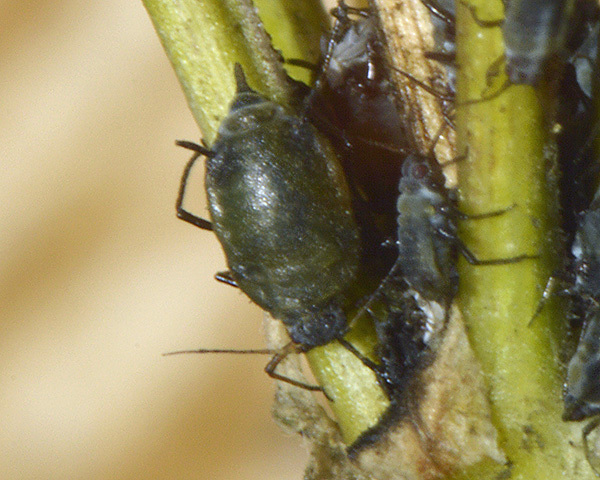 The honeysuckle aphid host alternates between its winter host (honeysuckles) and its summer host - umbellifers (Apiaceae) especially Daucus, Conium and Pastinaca, where they colonise the stems, leaves and flowers. The return migration is in autumn. Hyadaphis passerinii is found in Europe and the Middle East and parts of Asia. It has also been introduced to southern Africa, Australia and America.